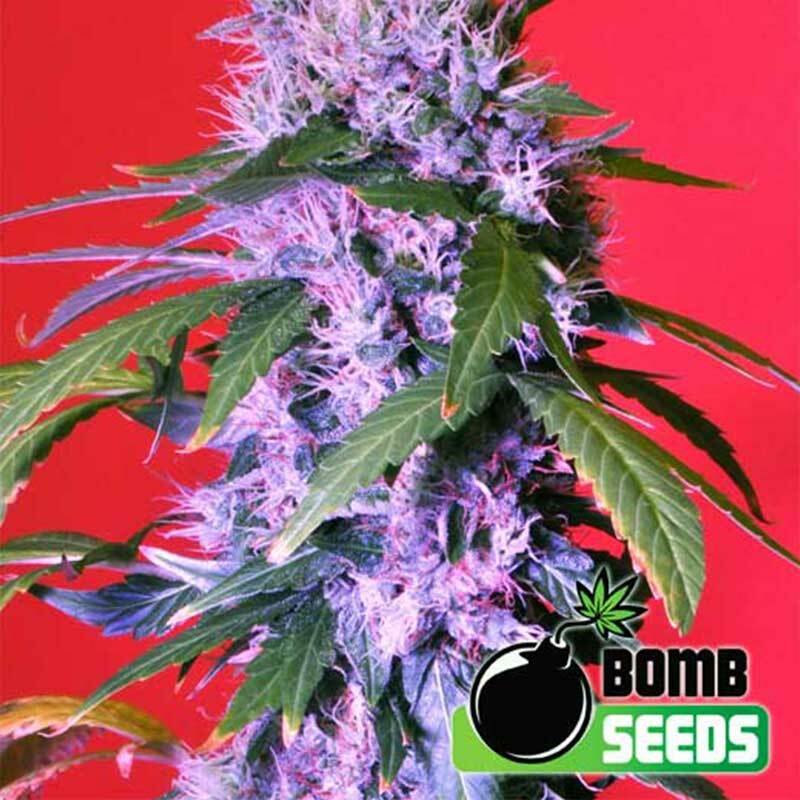 Berry Bombcannabis seeds are a special cross of a hand selected Blueberry mother with the all powerful Bomb #1 father. The result is outstanding; think Blueberry, but bigger yields, more THC and we think a better taste.The influence of our Bomb #1 strain gives Berry Bomb explosive growth while making the strain much easier to grow (both indoors and out) and easier to trim than the original. This strain produces a fat dominant single kola with large internodal distances and the characteristic explosive bomb upward growth. This is an excellent choice for SCROG. Indoors the plant will stay of medium height but outdoors this beauty can get huge.Like most purple/blue strains, Berry Bomb will turn blue under correct conditions (i.e. cooler, lower temperatures at night). It is considered to have good mould resistance. At harvest, buds are super frosty with a sweet berry perfume and taste. Delivering a classic indica high with some sativa qualities thanks to the Blueberry mother it won't lay you out for the count. This vigorous cannabis hybrid expresses the best features of its parent strains — a soaring Haze hig.. This is the auto-flowering version of the infamous New York City Diesel cannabis seeds.The plant gro..
Nirvana Eldorado is a remarkable Cannabis Sativa from the Oaxaca region of Mexico. At Nirvana, we ha..
Nirvana Blue Mystic was especially selected for its soft blue hues, which appear roughly halfway int..
Meet Pepe le Pew’s little niece and boy does she reek. This Swiss Cheese Automatic will knock you of..
- Northern lights x Big bud auto- Sugar Mango ryder- Pakistan ryder- Sweet Coffee ryder.. There are always lots of requirements to fill when deciding which strain to grow: strength, yield, f..